A thread for Kitty Foyle, the short-lived daytime soap based on the film Ginger Rogers won an Oscar for. A radio version had run from 42-44. According to Chris Schemering's book, for publicity the producers went on a lengthy talent hunt, involving over 200 actresses, before casting Kathleen Murray. Kitty wasn't introduced until five weeks into the show's run (which makes no sense to me and I wonder if that's why the show didn't last longer). When the show failed, Variety blamed the weak scripts and was surprised, considering that Carleton E. Morse (of One Man's Family) was the headwriter. The show was produced by Charles Irving, directed by Hal Cooper, and packaged by Henry Jaffee Enterprises. The show opened with location shots of downtown Philly. It aired on NBC at 2:30 PM EST. The run was January 13-June 27, 1958. From the June 1958 TV Radio Mirror. always dark and often cold. When at last I was able to rent an apartment of my own, I painted every inch of it white. The story of how Jose Quintero and the other young people around him converted a ramshackle structure into a theater and built up a much-respected acting company could make a book as long as "Gone With the Wind" and as funny as "My Sister Eileen" (which was written just a few blocks away. Describing her part of it, Kathy says, "We were always painting and cleaning and repairing. Our big aim was to improve the place so that we wouldn't get scared every time the fire inspectors came. All of us did everything. To start, I was captain of the john detail. My mother, who had a hard time getting me to clean the bathtub at home, would have been astounded to see the way I scrubbed." After all their manual labor, they also put shows on the boards. 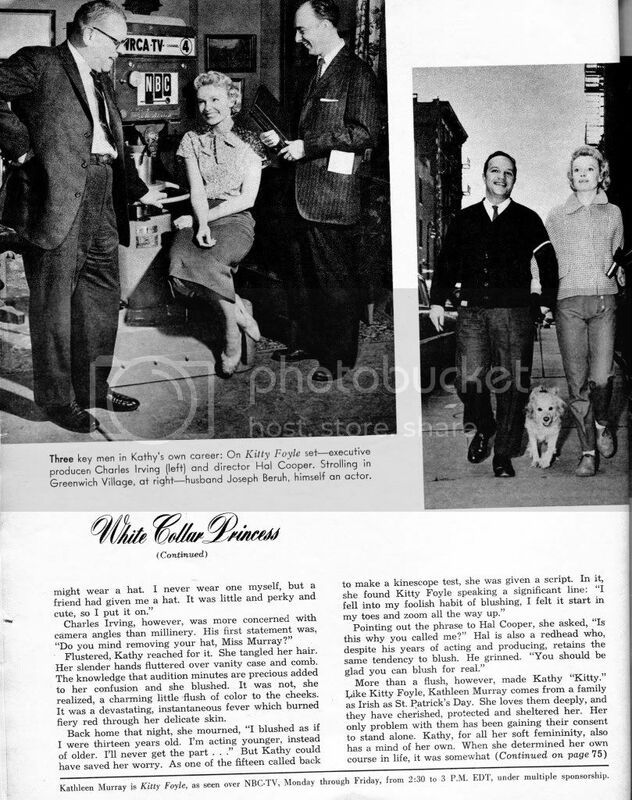 Kathy had her first part in "Dark of the Moon," in which she played a sixty-five-year-old woman. "We split the take. I got three dollars a week." But she gained experience and a new attitude toward life. "It wasn't so bad to be shy and sensitive when I discovered the others were, too. We worked out our problems together." Drama critics from the daily newspapers discovered, about that time, that something exciting, stage-wise, was happening down in the Village. They began to review the plays. Among the little off-Broadway theaters, The Circle gained a reputation for excellence. 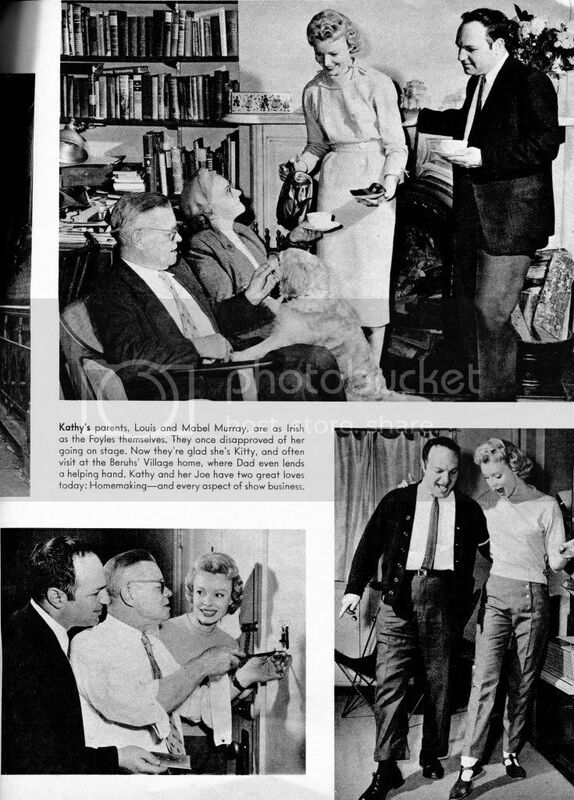 Its production of "Summer and Smoke" became a hit, made Geraldine Page a star and also brought some attention to Kathy. Offered minor Broadway roles, she turned them down. "I was learning more at The Circle and I wanted to stay with a group I liked." It was television which brought butter for her bread and, shortly, frosting for her cake. "I was so thrilled to get calls for TV shows. You know, TV does pay rather handsomely." Her first glimpse of a television studio came when, as publicity for The Circle, she appeared in costume and sang a madrigal on Ted Mack's Original Amateur Hour. Her first paid part was with Wally Cox on Mr. Peepers. She played his sister's roommate. "He's the nicest ever. He made up a scroll and presented it to me. It was titled, 'To Kate, with a smile, for the smile of the week.'" The TV roles also brought a reconciliation at home. "When my dad saw me on our own living-room screen, he conceded that acting might be respectable after all. He even became a little proud of me. I went home at Christmas and all was forgiven. We're the best of friends. Whenever we need something built in our apartment, Dad packs up his tools and comes over to help us. But, more important, both Mother and Dad think my husband is just great." Kathy's husband is Joseph Beruh, a young actor from Pittsburgh who, this season, played in the Broadway success, "Compulsion." As might be expected, they met at The Circle. They had one date (Joe took Kathy to see "St. Joan"), then paid no attention to each other for a couple of years. While playing in a Philaedlphia production of "Legend for Lovers," they formed the habit of going out for coffee after each evening's performance. They talked until all hours, but neither considered a romance until the show closed. Kathy returned to New York; Joe stayed on to appear in "Ah Wilderness!" Distance did make the heart grow fonder. Says Kathy, "After a week, I realized I loved him." They were married at City Hall on May 21, 1957. Kathy says, "I cried all during the ceremony and Joe stood and laughed at me." They live in one of the charming old houses on Twelfth Street, in the Village. "We've got two fireplaces, one in the living room, the other in the dining alcove," says Kathy. Like most young actors, they've wondered whether it would be wise to furnish it completely, for they have feared that they might need to follow the TV shows to Hollywood. 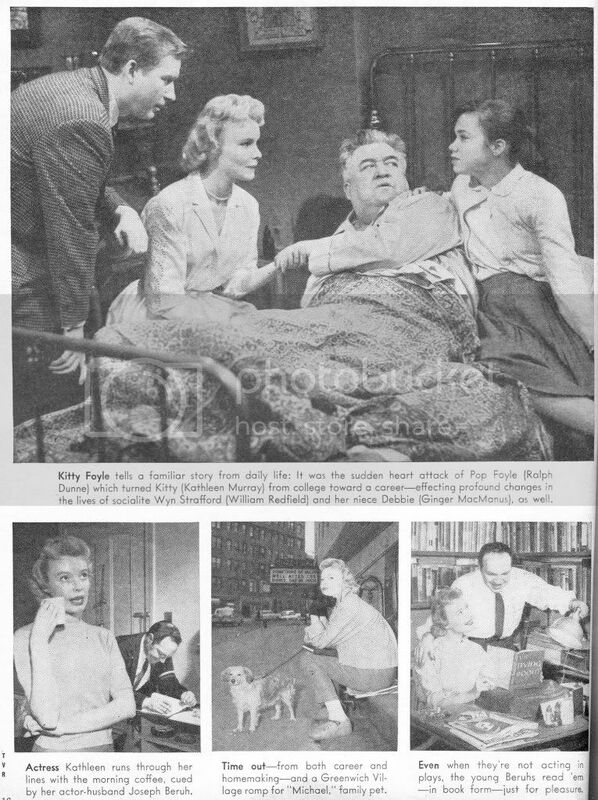 When Kathy went out to play a role on NBC Matinee Theater. "They wanted me to do a second show. We planned to make it coincide with the end of the Chicago run of 'Compulsion' so that Joe would be ready to come along, too." Now Kitty Foyle has given Kathleen, the actress, a chance to be Kathy, the home-maker. "I've bought stacks of decorating books and I shop every moment I can spare. We need a new couch, another chest, some clothes..."
Kathy has what Kitty Foyle wishes for; A career, and - even more importantly - a husband and a home too. This short-lived soap opera was NBC’s first new soap in over 3 ½ years and it’s first soap opera in a year and a half (since the cancellations in December 1955, of First Love and The World of Mr. Sweeney). In retrospect, NBC probably shouldn’t have bothered. While Kitty Foyle holds the distinction of being NBC’s first 30-minute soap opera and the first soap opera to premiere at 30 minutes since the premieres of As the World Turns and The Edge of Night almost two years earlier (every soap opera to premiere after ATWT and Edge would be 30 minutes), this series was absolutely panned by the critics who held issue with everything from acting to writing. Of course, NBC surely had great expectations for this series considering it’s lineage. It had originally been a best-selling novel by Christopher Morely and then a major 1940 feature film, which starred Ginger Rogers in the title roll, winning the actress an Academy Award for her performance. It had also been a highly successful radio soap. Unfortunately, the series got off to a rather rocky start and never recovered. Even though the show was titled Kitty Foyle and was about Kitty Foyle (as well as her family who all lived in Philadelphia), Kitty didn’t even make her first appearance on the show until almost a month after the premiere. It had been a publicity stunt set up to stage a nationwide search for the actress who would play the important part (assuring the winning actress as much stardom as Ginger Rogers, of course), but the soap folded after only 6 months on the air, unable to beat the hugely popular Art Linkletter's House Party, a variety show, which was a staple on CBS. For the record, the winner of the contest to play Kitty was Kathleen Murray who never became a big star, only appearing in a handful of guest roles on prime-time television and a bit part in a 1987 movie. Thanks for typing that up. I love reading those. I didn't realize until after doing this that Kathleen died pretty young...at least she and her husband were together to the end, and had a family. I'm sorry none of this show exists as something of a record for her. Kitty Foyle aired on NBC in the late 1950s. Was Sigourney Weaver's father still the president of NBC daytime then? On a radio soap board, it was insinuated Weaver wasn't interested in soaps and would drop them in favor of other programming rather quickly. 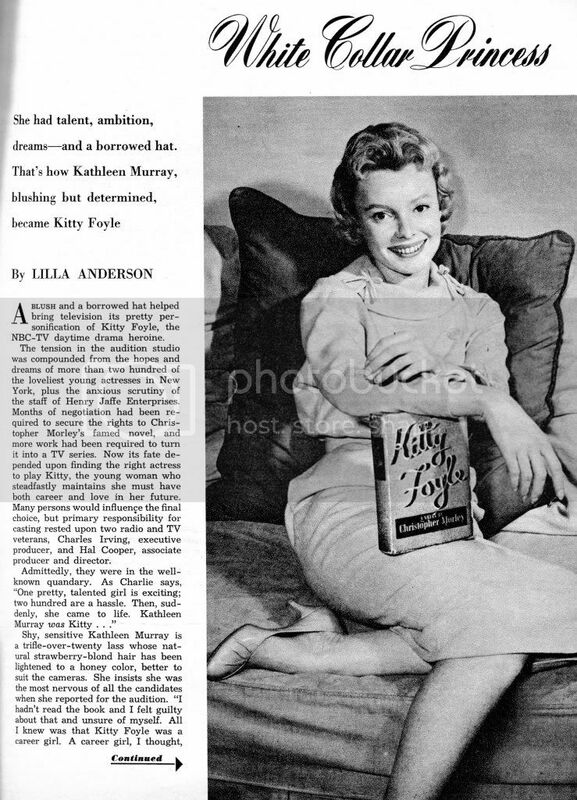 Also, the novel and movie Kitty Foyle is based on is fairly racy. Kitty becomes pregnant by a married man. In the movie, I believe she miscarries, but in the book she has an abortion. I think Kitt Foyle might have been to controversial for a conservative daytime viewer even if the soap didn't follow the book's storylines. I believe a similar sentiment was expressed about Mona Kent's proposed serial in the Proposed Soaps thread. That's interesting. I wonder how he felt when Sigourney acted in soaps. Kitty Foyle had been a book,a movie and a radio soap.I wonder which template (if any)they planned to follow? Isn't this the same actress who changed her name to Peg Murray and was on Love of Life, Another World, and All My Children? No. This actress passed away in 1969. Sort of a weird ad. Could that be an early advertisement prior to Kathleen Murray's hiring? Carleton E. Morse didn't have much success on TV despite "One Man's Family" having such a long run on radio. Some of his papers are housed at the Thousand Oaks Library along with John Pickard / Frank Provo's papers. John Pickard had adapted "One Man's Family" for Austrailian radio before arriving in the States where he ended up staying with Morse and meeting Provo, who I believe was acting on OMF as Claudia's husband or suitor. I've wondered if Morse and Pickard kept in touch despite Morse being West Coast and Pickard/Provo being East Coast. It's a shame Murray died so young. This was only a few years after Liza Chapman's (AW) untimely death. Kitty Foyle, the only other half-hour soaper with a rating history, is far from being an audience success and there's been a recent shakeup in the stall producing the strip. The current script doctoring will modernize the story and background since it is now felt that by sticking too closely to the book, the serial had a dated quality. Despite talk to the contrary NBC says it is far from giving up on the show.It is generally felt that the half hour soapers require a lot of script revisions and molding before the successful story line is finally achieved.